A Dubai SME 100 company, RAW Coffee Company is an award-winning boutique roastery, espresso bar, and training facility, founded in 2007 by New Zealand native Kim Thompson, and later joined by fellow New Zealand native, Matt Toogood in 2009. 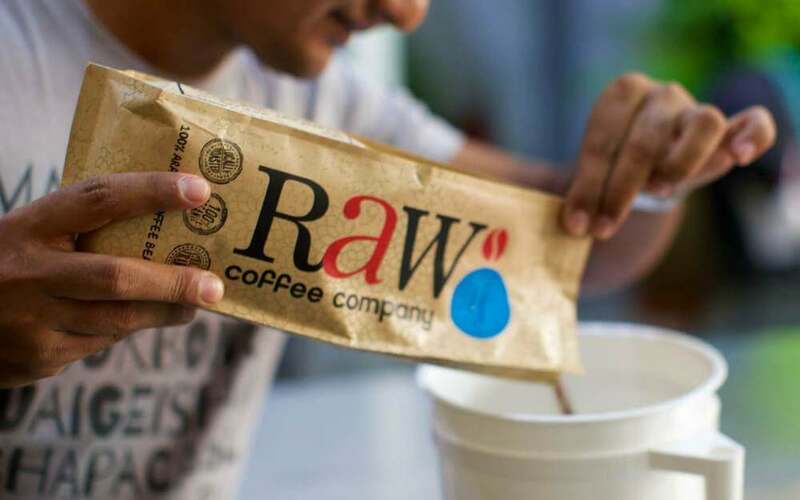 Located in Al Quoz and roasting 100% organic, ethically-traded, Arabica beans every day, RAW Coffee Company is one of Dubai’s most successful roasteries, supplying hundreds of cafes, restaurants, hotels, and homes in the GCC. As members of the Specialty Coffee Association, the UAE national chapter and authorized Specialty Trainers for the SCA, both Kim and Matt are invested in supporting the growth and awareness of specialty coffee in the region. 1.1 What is unique and essential in RAW website design? We are a coffee company so first and foremost, customers come to us to buy coffee. Because of this, we need to be able to display our coffee in a clear and digestible manner. We pride ourselves on the way we source our coffees, with over half of these being direct trade, meaning we actually travel to the places where the coffee’s grown and build relationships with farmers and/or producers. This gives us a wealth of knowledge we can pass on to our customers so they can see exactly where their coffee comes from. Working on Shopify Plus has allowed us to tailor our coffee product pages to pass on this info in the way we want which makes things easy for people buying our coffee. The pages were all custom designed via photoshop according to our personal style and allowed to transfer our personal brand feel on the website. 1.2 Why do you prefer shopping on the new RAW website? The loyalty program is so cool, it makes me actively collect points and utilize them against my coffee purchases! Recommending it to friends even more since then. 1.3 Which feature do you like the most when browsing through the RAW website? I love our subscription service! It’s super easy to navigate and allows people to just forget about purchasing coffee for the weekend and their usual groceries and have it delivered right to the doorstep. 2.1 How do you operate the backend of your website and why? The backend operation of Shopify is very straightforward and easy. We have our admin and technically anyone of our team who is able to adjust and post news and blogs on our page, it makes it quick, efficient and interactive, this is awesome! No other platform works this way. 2.1 Comparing time/money factor, what is your advice to everyone out there not yet using Shopify? Shopify is an incredibly powerful platform with great reporting and a really easy-to-use app. The Shopify app gives me loads of information I can access from anywhere, allows me to edit products on the go should I need to (this was really important with the advent of value-added tax (VAT) in the UAE). We now use, Shopify Plus, which is the enterprise platform of Shopify – Platform fees are more expensive compared to the standard plan but we’ve noticed the difference in features and support (customizable) functionality and an increase in sales by 20-30% in the first two months. For SMEs, I wouldn’t use any other platform for E-Commerce, its quick, easy and you make your money back immediately. 3.1 What is your recommendation in terms of E-Commerce solutions & ecosystem providers and why? Shopify is THE platform to use when it comes to E-Commerce in the UAE. It is amazingly retail/ customer oriented and has a bunch of great ecosystem providers/software that integrate to support the store and its sales power! Payment gateways, major software for remarketing and SEO optimization apps are just easy and great to use while showing a great increase in customer traffic and sales on the website. The advent of VAT proved to be quite challenging as the guidelines around price increases was vague and very strict. This caused to have to change our pricing a few times which was a headache. Being on Shopify Plus made it easier which was great When running a small business you have a million other things to do. Another challenging part is the payments, a lot of people prefer a payment via COD (cash on delivery), creating more and more trust on our website was key in reducing the cash payments and transferring the payments into e-payments. The automation of subscriptions is awesome, but was challenging and not easily accessible to all, however, Creative971 had an awesome solution. 4.1 What is the difference for you in your daily life? Many processes are automated and synced to our accounting and other software/apps we use. I also love the app on my phone which allows me to track our daily, weekly and monthly performance anywhere. We can also see where our sales are coming from, allowing us to create a more targeted and efficient social media and marketing strategy. 4.2 What does it offer to your clients? Because we can customize a lot within our site, we can make our pages and navigation really easy for our customers. Being able to tie in apps and retargeting marketing tools makes our life easier and more streamlined. Hopefully, this allows our customers to see products they may not have been aware existed and can improve their coffee experience with us. 4.3 Enterprise E-Commerce solution without the IT headache, please share your experience. Definitely! As mentioned in the initial part, our admins etc can simply access, adjust and amend our website. No hassle with data or website security, as Shopify is PCI level 1 compliant and eases all IT pains away! I would definitely recommend Shopify and Shopify Plus to any SME looking to improve the efficiency of their online E-Commerce platform. Creative971 is the leading Shopify Agency within the region and not only delivered an amazing work but guided us through every step. We’ve had endless compliments about the visuals these guys managed to create for us. To sum up, an awesome E-Commerce platform for the money you pay.